GeoSpec is the industry standard NMR rock core analyzer, with installations in nearly all leading oil producers and SCAL laboratories across the globe. Three models are available operating at 2, 12, and 20 MHz. The GeoSpec 2 MHz models are the industry standard for regular measurements of relaxation distributions, enabling the prediction of simple petrophysical parameters such as free and bound fluid determinations, porosity, and T2 cutoff. These instruments work at 2 MHz to decrease artifacts caused by ferromagnetic material in the samples and to imitate the functioning of the NMR logging tools. Higher field (12 and 20 MHz) GeoSpec models can be purchased for situations where higher sensitivity is paramount, for instance, extremely low porosity samples, and for unique applications such as Magnetic Resonance Imaging (MRI). 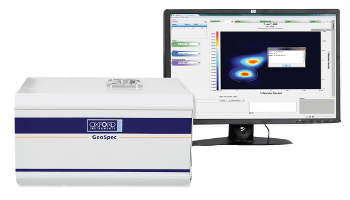 The GeoSpec series of instruments is the outcome of a successful long-term partnership between Oxford Instruments and Green Imaging Technologies (GIT), the world leaders in software and hardware for NMR core analysis. The GeoSpec includes instruments from 2 MHz to 23 MHz operating frequency, managing samples from ½ to 6″ diameter, with incorporated software and accessories to match all users from standard core analysis to advanced petrophysics research. P5 Cell: Nuclear Magnetic Resonance (NMR) is a useful tool for both standard core analysis and SCAL. Most measurements are carried out at room temperature and pressure, but it is becoming increasingly important to perform measurements at as close to reservoir surroundings as possible. The P5 Cell, unique to the GeoSpec family of NMR rock core analyzers and available for 2 and 12 MHz models, allows users to achieve this. Designed and built with a focus on performance and usability, the cell allows customers to pressurize samples with up to 5,000 psi of confining pressure, at up to 100 °C.